In this Saturday Nov. 7, 2015 photo, travelers board the Roots on the Rails music train in Bellows Falls, Vt. The special train made its first East Coast Trip between Bellows Falls and Rutland, Vt.
Stacey Nakasone had a choice to make. Fly from her home in Los Angeles to Japan to learn more about taiko drums, or take a 50-mile train ride in Vermont. For Nakasone and about 50 other people this fall, Vermont it was. The destination was the East Coast's first visit by the "Roots on the Rails'' series, which since 2003 has developed a cult-like following that combines rail trips with music, meanwhile bonding passengers to one another and to the musicians. "You become addicted,'' said Nakasone, who has been making the trips since 2009 after reading a news story about a much-longer Western trip. Roots on the Rails grew out of a 2000 trip a group of musicians took from Toronto to a music conference in British Columbia. Along the way, the musicians just wanted to play, said founder Charlie Hunter, a former music promoter and a painter of aging American infrastructure who now lives in Bellows Falls. "The rhythms of American music are inexorably tied in with the rhythms of the rails,'' said Hunter on the Nov. 7 Vermont trip while the train - seven cars including four passenger cars - rattled over the tracks along the 50-mile route between Bellows Falls and Rutland. He dubbed the chartered Vermont train "The Green Mountain Express.'' He hopes that next year the train can continue north from Rutland to Burlington and, perhaps after that, elsewhere on the state's rail network. 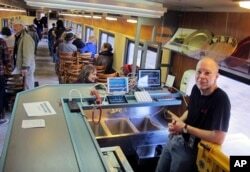 In this Saturday Nov. 7, 2015 photo, sound technician Dan Richardson rides aboard the Roots on the Rails music train during its first East Coast excursion between Bellows Falls and Rutland, Vt. The trips are marketed to fans of the specific musicians who play the broad genre of country-folk. Hunter called one of the musicians on this week's trip, Jimmie Dale Gilmore, one of the most distinctive voices in the genre over the last 40 years. The other acts are all well-known in their own way, he said. Jack and Claudia Gaffey, of Kensington, Maryland, members of the American Association of Private Railroad Car Owners, rode the Amtrak Vermonter to Vermont so they could ride the music train. Unlike many who made the trip, this was their first Roots on the Rails trip, but they've already signed up for a longer trip next summer out west.